Thanks for coming to our 2nd annual tournament! See you next year. 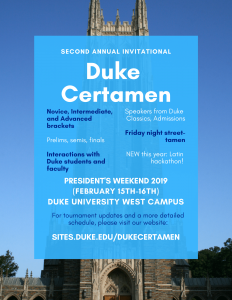 Duke University Certamen Invitational is powered by WordPress at Duke WordPress Sites. Please read the Duke Wordpress Policies. Contact the Duke WordPress team.